Click here to view our 28.5V DC GPU Specification page. AirMAK’s AC Ground Power Units can be supplied with additional 28.5V DC module and small 50Hz inverter for obtaining commercial power voltage for tools, appliances etc.. during aircraft maintenance. MAK 28.5V DC GPUs built with a diesel engine is used for smaller turbo-prop aircrafts requiring 600A/800A DC and starting current of 1500A/ 2500A DC. These units are made compact keeping in mind the space constraints around small aircrafts. 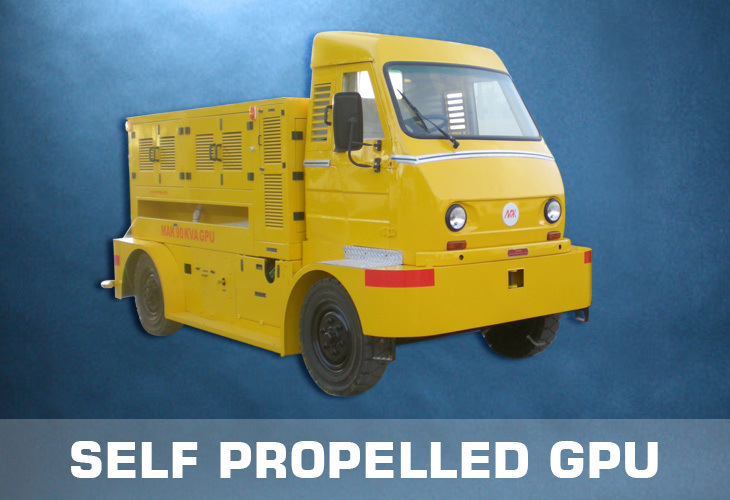 AirMAK – designs and manufactures self-propelled type Ground Power Units for customers who require quick shuttle across aircraft bays and GSE workshops. 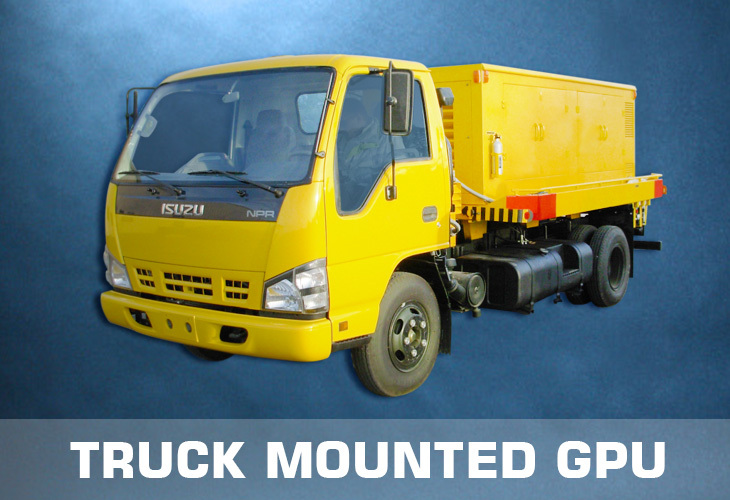 Self-propelled systems operates on the electric or hydraulic system and can also be made skid mounted for fitting on standard commercial trucks based on customer requirements. 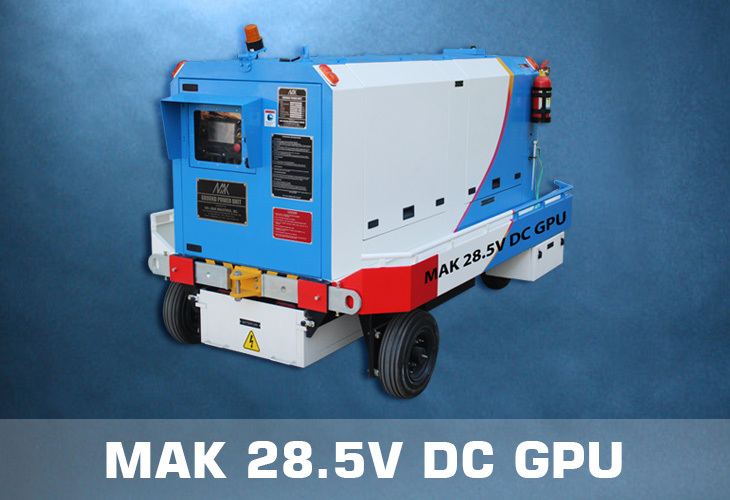 AirMAK’s Battery carts offer 28.5V DC output through its specially factory-made high discharge batteries. 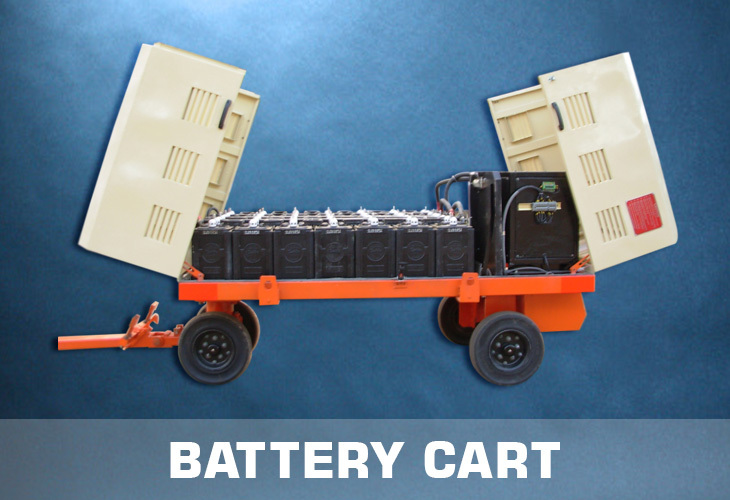 These battery carts contribute to environmental friendliness and quiet operation. Ground Power Unit is used to give power to various aircraft systems and start aircraft engines by electric starter mechanism. AirMAK is a pioneer in digital 400 Hz Ground Power Units across the world and manufactures Industrial and defense applications since last three decades. 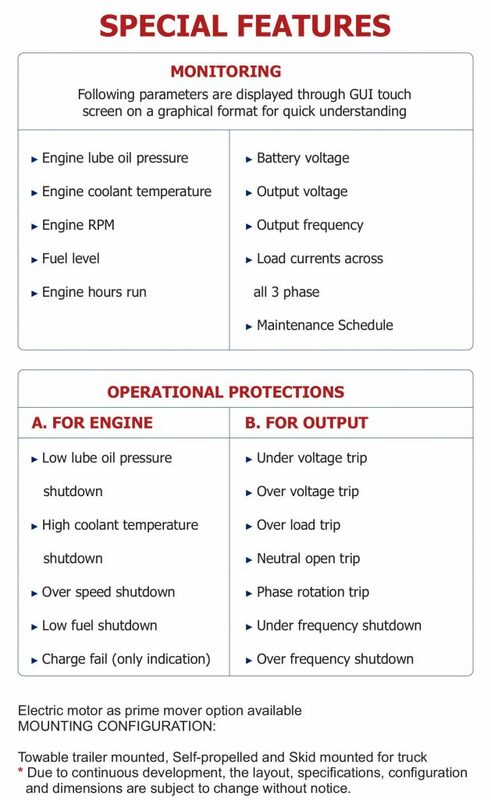 The diesel engine / electric motor coupled with Air MAK extremely reliable alternator provides an ideal output for the aircrafts. The GPU with touchscreen control panel and interactive GUI is easy to operate and effortless to maintain. AirMAK’s specially designed double bearing brushless alternator with highest quality insulation guarantees operational strength and long life. AirMAK GSE Monitor – A touchscreen control panel with GUI Interface is employed to showcase outline of all parameters in graphical format with inbuilt maintenance chart, fault log chart, and also the troubleshooting guide. AirMAK RDMS – Remote Diagnostic and Monitoring System for GSE’s is a unique feature of AirMAK that comes as standard with all GSE’s. Its feature-rich software system and hardware offer parameters monitoring, fault alarms, Geo locations, Maintenance alerts etc. It is a great management tool for a GSE-Head. One can communicate with the equipment on the touch of a button and complete history is made available at fingertips. 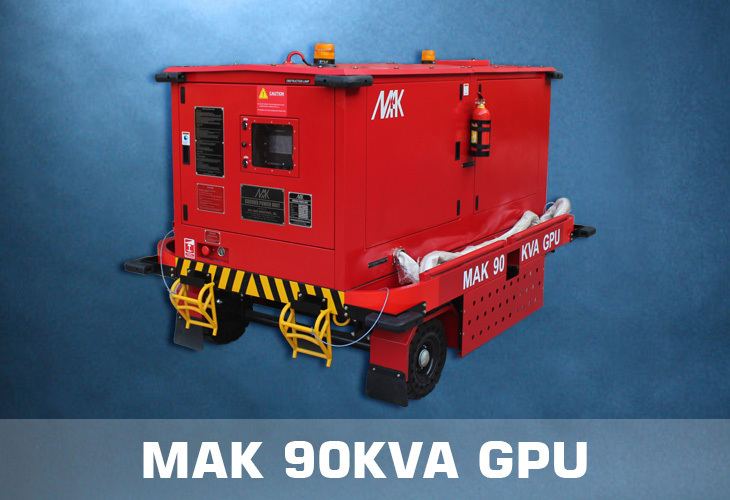 AirMAK GPU’s are designed to comply with demanding standards of AHM, ARP, MIL etc. 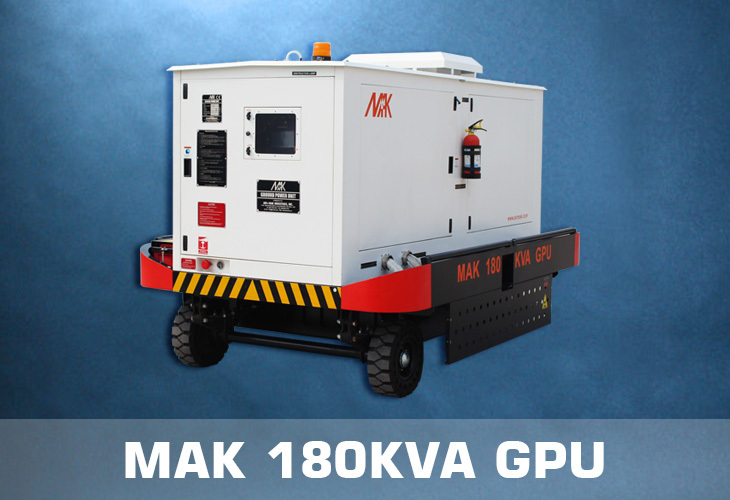 AirMAK GPU’s are CE Certified and provides customers a unit par excellence. There are various operational and physical protection mechanisms Included in AirMAK GPU’s for fail-safe operation and secure throughout any untoward faults or basic mishandling. Ground Power Unit by AirMAK is built with high strength to handle tight weather operating conditions. Click here to view 28.5V DC GPU Specification page.